New Home Feed puts photographers and their images into the spotlight. 500px has revealed that its site has had a huge redesign, with the Home Feed now powered by machine learning and inspired by the humble photo book. The photography-centred social network has revealed that its new Home Feed will focus on quality images, rather than the amount of hits these images have - hopefully balancing the power of the site for its user base. Speaking in a blog, the 500px team explained: "We’ve changed the look and feel of your 500px Home Feed. Both web and mobile platforms now feature a cleaner and more contemporary design inspired by photobooks. 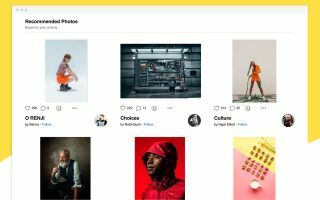 "The new layout’s aesthetic will better showcase the photos in your Home Feed and introduce you to new content from photographers you may not have discovered." As with any redesign, some users aren't that pleased with the new look. A number of users have taken to the blog's comments section to see if there is a way to get the old design back, with the biggest issue being that some users just want to have pictures from those they follow and not other photographers that the new feed showcases. Given 500px community is 15 million strong, we reckon they will be monitoring closely to see if the new Home Feed does what they want it to. Facebook had similar criticism way back in 2006, when it changed its newsfeed, and now it's the most successful website ever. The new Home Feed comes at a time when photo-sharing communities are changing how they do things. Flickr recently announced big changes to its free service and there's more rumours that Instagram will allow photo sharing. Back in July, 500px shifted away from allowing Creative Commons photography on the site, shutting its stock photo platform.